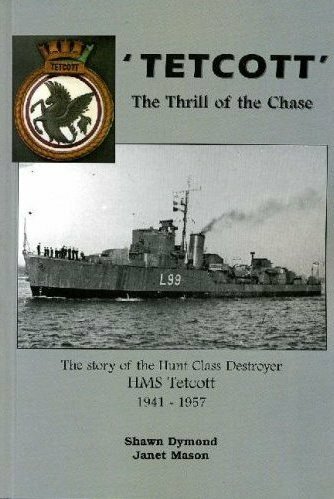 "Tetcott - The Thrill of the Chase"
This 270 page book contains over one hundred photographs and covers the full history of the ship from her inception in 1941 to her final demise in 1957. Spending almost her entire service life in the Mediterranean, it is the story of a lucky and, predomanently happy ship, brought to life by the inclusion of memories and anecdotes of some of her crew - many of them humorous, whilst others portray the darker side of war. Ten detailed appendicies complement the main text, including biographies of her Commanding Officers and First Lieutenants plus appendices devoted to the veterans and other identified crew members. I was delighted to be associated with the launch of the book “TETCOTT - The thrill of the Chase" in October 2006. This is a unique account of the story of a small yet highly successful Hunt Class destroyer in the Second World War. It is particularly detailed in the way in which it charts the life of this vessel both in factual terms, where she went and what she did but also in the wealth of information about the people who made up her small, young and often very inexperienced crew. HMS TETCOTT took part in virtually every major action in the Mediterranean Theatre and came through unscathed, a tribute to the skill and fortitude of her people. At a time 60 years on when the role of navies in the post-Cold War and high technology strategic environment is very different to what prevailed in TETCOTT’s short life, this very readable tribute to the Ship and her Company serves to remind us of the adversity they faced. I commend this fine book to anyone, naval history buff or otherwise, looking for a good read.